We had been sent home to die. At least that's how it felt when our oncologist suggested hospice care. They don't want to do chemo because his liver is not functioning. And we had a week of preparing for death. One night we laid in bed and talked about ashes. But then I started thinking "what if?". What if we can get his liver functioning? I've seen so many stories online in various health chat rooms of people with cirrhosis of the liver, and being on transplant lists, and livers riddled with tumors. 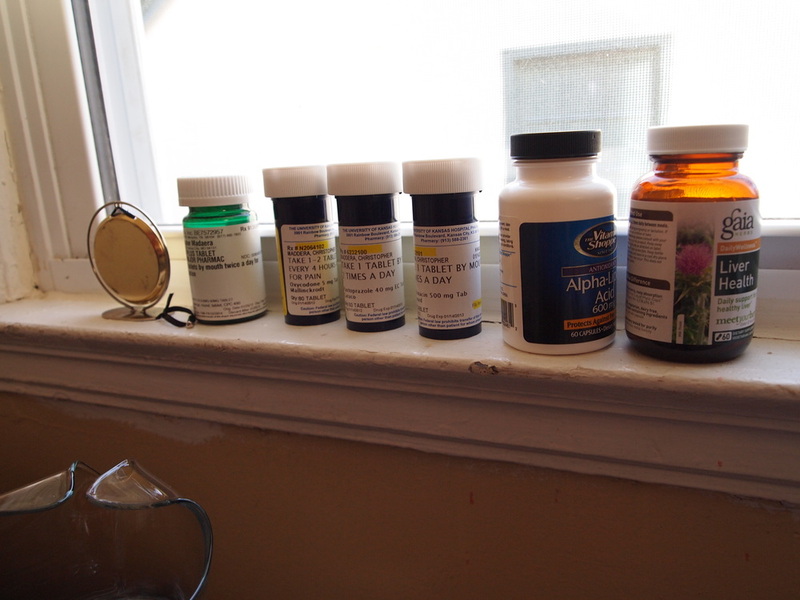 I've read so many stories of the wonders of Alpha Lipoic Acid and Milk Thistle. One story I read was about a guy who had been told that he would die without a liver transplant. He walked with a cane. He started a regiment of ALA and Milk Thistle and now he runs every day. It's hope I can buy into. Last Thursday they went and replaced his drains with bigger ones. The procedure left him in a lot of pain and he still didn't want to eat or drink anything and the last few days have been a constant battle. Battling the need and inability to take in nutrients. Battling pain. Battling to move. Battling to maintain some sort of hope. I begin to feel the darker worries set in. I worry my will for him to live is stronger than his own. I worry that tomorrow will be worse than today. I worry that I just don't have enough super human strength to fix him. And then we'll have mornings like today. The kind of morning where the pain is manageable. The kind of morning where I get him to eat a whole carrot and some grapes and drink half a glass of Gatorade. The kind of morning where I feel like we've done something successfully. And we start to chug up that hill preparing for the next drop, curve or twist of the ride. And just maybe tomorrow will be better than today.